Skruf Snus AB is a Swedish­based manufacturer of authentic Swedish Snus. Founded in 2001, Skruf Snus is a relatively new snus producer which boasts a fairly extensive range of products spanning a wide number of formats and flavors. The Skruf brand is a premium snus well known for its special blend of tobacco, bergamot, and rose oil which is mixed in carefully measured amounts to ensure a delicious taste. In 2001, lifelong entrepreneurs (and friends) Jonas Engwall and Adam Gillberg got together and began planning how they could put their talents to use in order to create an authentic Swedish product. After much research, the pair decided to enter the Swedish Snus market by creating a premium product with an emphasis on standing out in the crowd. With a limited amount of funds to realize their goal, the pair travelled around Sweden learning as much as they could about the snus industry. Along the way, the pair encountered the Swedish marketing guru Michael Storaker and a researcher by the name of Kent Sandh. Together, they began producing a snus locally in a small place called Skruf in Sweden’s Smaland region. In 2003, the group began to ramp up their operations, using an old dairy factory as their base of manufacturing. With a high quality and delicious tasting snus product now being manufactured, some adjustments were made and the second member of the Skruf Family (Tranbar) was born. Tranbar is a cranberry flavored snus with hints of Skruf Original present. Skruf also came in light colored cans with flashy designs in order to catch the attention of consumers. The efforts of the group began to pay off, and Skruf’s popularity began to build through word of mouth. In the spring of 2004, Skruf launched in Norway and was featured on Norwegian primetime television. The day after its launch, one million Norwegians were searching for Skruf Snus, propelling Skruf’s marketshare from 0% to 4% virtually overnight. 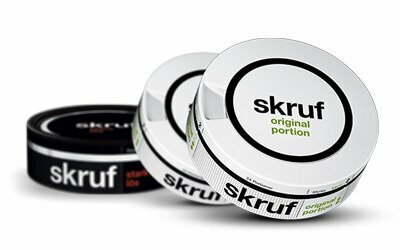 According to Adam, Skruf’s popularity is due to “Offering a cooler, premium, and extremely personal snus. Quality and individuality comes first, and if you want to make a statement with a bit of attitude when choosing snus then you really only have one choice: Skruf.” Skruf also began expanding its marketshare outside of Scandinavia by developing new products for markets overseas. Today, Skruf is now owned by the world’s fourth largest tobacco company, Imperial Tobacco. With more than 10 million cans of Skruf sold each year in Scandinavia, Skruf has helped to strengthen Imperial’s portfolio in the growing snus market and is one of the most popular premium brands of snus on the market. There are now many variations of Skruf available today including Original, Tranbar, Slim, Polar White, Stark, Fresh White, and Nordic White.